LinkedIn is a great tool for your career as a developer. Learn how to use it and some tips in this article. There are a few things that should be on your LinkedIn profile. I’ve listed them here. Right at the top of the profile is an area that can be used to enter information about yourself. This “Summary” section is used to describe your role, briefly what experience you have, any certifications you might hold and what you’re currently doing or looking for. This is similar to an overview or summary section on your resume. It should be easy to read and provide visitors to your profile with a quick overview of who you are and what you do. While there are separate sections for your skills and experience further down on your profile, this provides a brief summary of who you are and is recommended that you have one filled out. LinkedIn is a bit different from other social media websites (such as Facebook) when it comes down to what you should and shouldn’t use on your LinkedIn profile. One of these is the profile picture. It’s a professional website, so you should be using a photo of yourself. Use a clear headshot photo for your LinkedIn profile. Don’t use a group photo or a photo that doesn’t even show you, or a picture of a dog or something. It should identify you and it should be a good photo. You can use your phone camera if you need to, but you need to make sure that the final photo is a good one. It’s also quite common to use a professional photo as well – take the time to get some good quality photos taken, which you can use one your LinkedIn profile. Entering skills on your profile should be one of the first things you do when setting up your LinkedIn profile. IT is a very skills-based field with a lot of things that can be learnt and applied to the job. Programming languages, operating systems, hardware, and many other skills can be entered into this section. These are used not only to let others see what you can do, but also for others searching for skills – your LinkedIn profile has a better chance of showing up if it has the right skills entered. You can also get endorsements for your skills. When browsing LinkedIn, sometimes a box will appear asking you to endorse someone’s skills – basically, approve that they have the skills that they say they have. If you click Yes, then they will receive a +1 to the number of endorsements for that skill. The same goes for other people trying to endorse you – people can vote that you have the skills you have mentioned. It gives you a kind of proof and recognition that helps your profile stand out. A great way to improve your LinkedIn profile is to get recommendations for your past roles. There should be at least one recommendation on there for each of your past roles. This is a paragraph or two from someone in your network on the work you did for that role. It helps your chances of getting roles in the future, and can also let other people know exactly what you were like to work with in that position. People who are in your network can either leave a recommendation themselves, or you can send out a message to people asking for a recommendation. Sending out a message may seem a little strange at first (it does to me, at least), but it’s a good way of getting feedback. It’s also easier if you’ve been doing a good job! Your profile should include the roles that you have had in the past. This is similar to the Experience section on your resume. It should include the name of the company, your role there, and some information on what was done as part of that role. As with many of your other LinkedIn profile sections, this should be descriptive and able to be understood by other readers. Write a couple of paragraphs or some descriptive bullet points on what your role involved at this company. Try to keep it free or jargon and overly technical terms – future employers may not understand a lot of this. LinkedIn allows you to become a member of user-created groups. These groups are focused on a specific interest, and sometimes location. There may be groups for SQL Server professionals, IT job seekers in London, or even current and past IBM employees. Search for some groups that may interest you and reflect your skills, and apply to become a member. Some of the groups have immediate acceptance, and some need to be approved. Joining groups will demonstrate your interest in various topics, and will also display at the bottom of your profile. You can also participate in these groups, as it allows you to meet new people with similar interests and can help your future job prospects. You can also learn a lot from these groups, especially those which are quite technical and related to the skills you use in your job. By default, your address for your LinkedIn profile is quite random and messy. It’s hard to remember and even create a link to (unless you copy and paste it). The good news though is that you can actually change this. You’re able to specify a unique value to use as a short name to identify your profile. If it’s accepted, you can use this to refer to your profile. It’s helpful for business cards, email signatures and other profiles. For example, if you specify a short name of “jsmith”, then your profile URL might be something like http://au.linkedin.com/in/jsmith. This is much easier to read than the old URL which would have been a long list of numbers and characters. Of course, a name like “jsmith” might already be taken, so you’ll have to enter a unique one. The AU part reflects the fact that I’m Australian, so your URL may be different. LinkedIn offers a feature called LinkedIn Premium. What is it, and is it worth getting? LinkedIn Premium is a collection of extra features offered by LinkedIn which are not available to standard, or “Basic” level users. These features allow you to make the most out of the LinkedIn platform and connect with people for a variety of reasons. 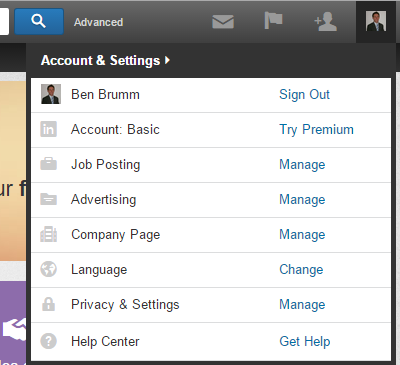 To access the LinkedIn premium information page, log in to LinkedIn. Hover over your profile picture icon on the top right, and select “Try Premium”. The LinkedIn premium page will appear. Now, the look of this page will depend on when you view the page, as it looks different to last time I opened it and LinkedIn may change the design again at a later date. You’ll see your name and a question about the free trial of Premium (which may or may not be there in the future). Now, here’s the main part. This Premium page is broken up into four sections. 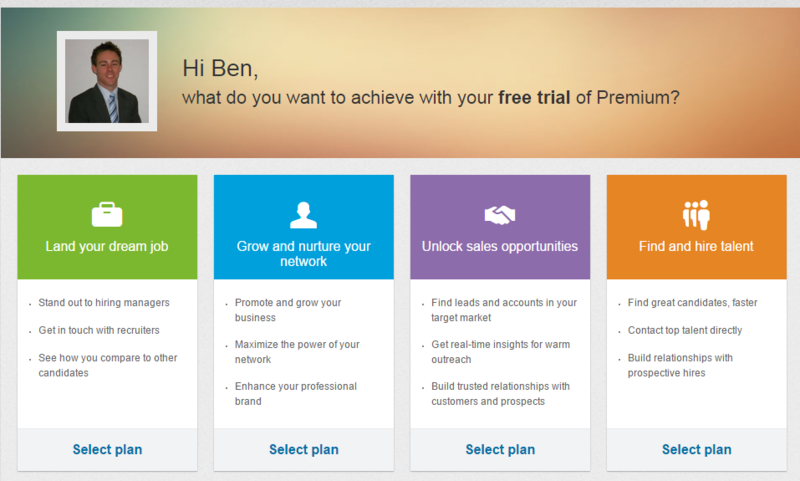 There’s one section for each type of user or each “reason” for using LinkedIn Premium. What’s the difference between each of these, if they are all for LinkedIn Premium? Well, they each offer different features tailored to a specific kind of user, and each has different prices. The one that you are probably interested in is the first one – “land your dream job”. This is the one that is targeted towards job seekers. “Land your dream job” is targeted towards job seekers, and is also called “LinkedIn Premium Job Seeker“. “Grow and nurture your network” is targeted towards business owners, and is also called “LinkedIn Premium Business Plus“. “Unlock sales opportunities” is targeted towards salespeople, and is also called “LinkedIn Premium Sales Navigator Professional“. “Find and hire talent” is targeted towards recruiters, and is also called “LinkedIn Premium Recruiter Lite“. Clicking on each of the boxes will show more details about that plan. We’re only going to focus on the “LinkedIn Premium Job Seeker” section, as we don’t really care about the other types. Why Should Job Seekers Get LinkedIn Premium? Basically, the reason to get LinkedIn Premium is to help you get a job. LinkedIn Premium helps job seekers do this using their Job Seeker version of LinkedIn Premium in many ways. The ability to directly message recruiters is helpful. LinkedIn Basic only allows you to send messages to people in your network or groups you have joined, and not messages to “cold contacts” (or people you don’t know). This feature allows you to message recruiters or even people who have viewed your profile. You’re allowed 3 “InMails” per day (an InMail is LinkedIn’s internal message to another contact). The “Who’s Viewed Your Profile” feature allows you to see everyone who’s viewed your profile in the last 90 days, where the Basic membership only allows you to see the last 5 people. If you’ve set up your profile to include the right information, then you’d want to see who’s viewed it. The “Featured Applicant” feature makes sure you stand out in the list of candidates when others look for a job and when you apply for a job. This makes it easier for recruiters to see you and can improve your chances of getting a job. The “Applicant Insights” feature allows you to see how you compare to other people who have applied for the same job, based on their LinkedIn profile. This one excites me as someone who comes from a database background (I’d like to know how I compare to others if I went for a job). All of these features allow you to be more efficient and effective at getting a job. Is LinkedIn Premium Worth It For Job Seekers? That’s what all of this comes down to. As a job seeker, is it worth it for you to get LinkedIn Premium? For this question, I’m only talking about the “LinkedIn Premium Job Seeker” version. None of the other versions are relevant for job seekers. While their features are good, they are probably too much for the average job seeker. My answer is yes, I think LinkedIn Premium is worth it for job seekers. Because the time taken to get a job can be greatly reduced by getting a LinkedIn Premium account, allowing you to start earning money faster, and even getting a better job than without it. However, I think that a change in perspective can really help. Paying the monthly fee for the Job Seeker version of Premium, which is the cheapest of the four options, can accelerate the time taken to get a job. If you start a job sooner, you’ll start earning money soon, which means you’ll more than pay for the LinkedIn Premium membership. What’s the Cost for Job Seeker LinkedIn Premium? Also, at the time of writing, LinkedIn offers a free 30-day trial, before their subscription starts, which is another incentive to try it out. After the trial ends, the service will cost $29.99 per month. Note that it is showing AUD $29.99 for me because I’m based in Australia. I’m not sure what the prices would be in other regions, so your page may show something different, but I assume they would all be pretty similar due to the exchange rates. This plan doesn’t offer an annual charge method as the other plans do. This is because Job Seekers may only be using it for a short period such as a few months, whereas the other Premium plans would ideally be used for at least a few years. What Are The Downsides of LinkedIn Premium for Job Seekers? Well, the major downside you might be thinking is the cost. However, the features should give you enough benefits to outweigh this cost and get you the job you’re after. The other downside is that you actually have to use these features to get the benefit of the membership. Sure, this might not be a downside, but it’s hard to find a downside from such a good service. If you’re paying for the membership, you’ll need to use the features. You’ll get the most from your membership if you send messages to recruiters, apply for jobs using the Applicant Insights feature, and see who’s viewed your profile. It’s not a “set and forget” membership that will allow you to get a better job magically. You should be using LinkedIn as an IT professional anyway. LinkedIn is a great website for people working in the software industry. Setting up your profile now, if you haven’t done so already, is a good idea. Just like other social networks, connecting with other people and checking it occasionally will help you get started using it.